The ULTIMATE ISLAND ADVENTURE. Experience Key West from the sea as you glide along with our professional guides through tropical waterways on your way around Key West and several nearby islands. Our 26 mile tour will take you through the Atlantic Ocean or the Gulf of Mexico, or both! Bring a waterproof camera because you could see the southernmost point, which is the most photographed site in Key West, a WWII submarine base, mangrove islands, and many other sites, including a variety of wildlife such as dolphins, stingrays, sea turtles, or manatees. You also will have plenty of time for "freestyle riding" along the way. To see a map of our tour route click here. What you should bring: * Bathing suit * Towel * Water shoes (optional) * Sunglasses (we have goggles available) * Sunscreen * Waterproof camera * Bottle of water * 1/2 Hour = $75.00 plus $10.00 per passenger * 1 Hour = $100.00 plus $10.00 per passenger * Tour (1-1/2 to 2 hours) = $125.00 plus $10.00 per passenger *Please add an additional 7.5% sales tax Hours are 9:00 am to Sunset and Tour Times are usually 9:30, 11:30, 1:30, 3:30 (or 4:00), and 5:30 (or 6:00 in summer). Please always check in 30 minutes prior to departure times. The driver must be 18 or older with a photo ID, but the passenger can be any age (if under 18 parent must sign for them). *Wetsuits and goggles are available. *You cannot participate if you're pregnant or under the influence of drugs or alcohol. 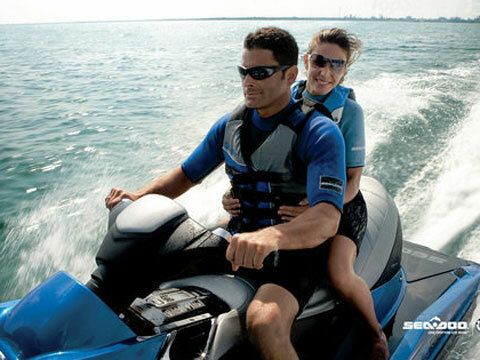 Security Deposit of $300.00 cash or credit card required for each jet ski. sland Water Sports is the #1 Island & Sunset Tour in Key West. We have the largest jet ski riding area in Key West. We feature Sea Doo GTX 4-TECs. Open 7 days a week, located at the Key West Westin Resort & Marina at 245 Front Street.